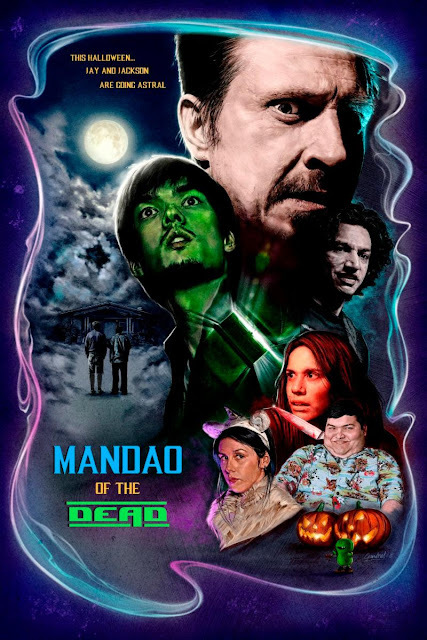 Mandao Films has announced a resurrection of Halloween spirits with the Digital HD debut of writer/director Scott Dunn's MANDAO OF THE DEAD. The spectral sci-fi comedy is now available exclusively on Amazon Instant Video, ahead of an iTunes release in 2019. The second feature from filmmaker Scott Dunn and producer Gina Gomez, MANDAO OF THE DEAD combines temporal hijinks with chills from beyond the grave in a film Horror Fuel calls "a charming winner of a flick." The unambitious Jay Mandao lives frugally off his late father's cereal royalties. He wants nothing more than to live in solitude, but is duped into taking in his adult nephew-in-law, Jackson. As Halloween approaches, Jay begins having odd dreams, and comes to find that he has the ability of astral projection. Jay and Jackson are approached by a ghost who has a small window of opportunity to reverse his death at the hands of Jackson's murderous ex-girlfriend. MANDAO OF THE DEAD is now available exclusively on Amazon Instant Video, ahead of an iTunes release in 2019.